We’ve tested a lot of doorbell cameras, but none have impressed us quite as much as the Nest Hello. It’s not just a good-looking doorbell; it’s also packed with an ultra-sharp 1080p camera and a whole bunch of features like facial recognition, time-lapse recording, and customized activity zones that add real value to the Nest Hello’s daily usability in any home. The Nest Hello costs around $229, falling somewhere between the Ring 2 and the Ring Pro. While that’s on the higher end for doorbell cameras, it’s pretty reasonable given the quality of the camera and all the features it offers. We also think the Nest Hello’s features hold their own against the more expensive Ring Pro. 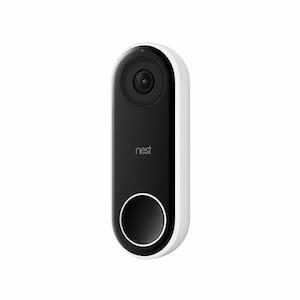 For a more in-depth look at how the Nest Hello price stacks up to its competition, take a look at some of our other recommended doorbell cameras. The Nest Hello works with the main Nest app, which is convenient if you’ve invested in other Nest equipment. If you pay for a Nest Aware plan, you can save videos, set up facial recognition profiles, create activity zones, and save custom clips. We found the Nest app was reliable and easy to navigate while testing the Nest Hello. We’ve tested Ring doorbell cameras and found that they’re prone to hiccups in their daily use. Depending on your Wi-Fi network, Ring’s connection can be finicky, for example, leading to blackouts or pixelated video. But the Nest Hello does a better job day to day, giving you more consistent performance. That’s important as you never know exactly when you’re going to need your doorbell camera. The Nest Hello offers a unique facial recognition software that recognizes and remembers faces. This feature turns out to be more than just a gimmick. It works as advertised, recognizing any face that comes to your door. Then you can assign names to faces to help the Nest Hello learn the difference between trusted users and complete strangers. If you have a Google Home, you can do some cool things with the Nest Hello. You can sync your Google Hub to work as a chime for your doorbell camera, which announces when someone comes to your door. And if you take advantage of Nest’s Familiar Faces feature, your Google Hub tells you exactly who’s at your door when a family member or friend stops by. The Nest Hello requires some complicated wiring. Most people will need to hire a professional. Nest can set you up with a local Nest Pro if you don’t have a go-to electrician. Our setup took a couple of hours due to some wiring complications, but if you already have the right wiring in place, it won’t take nearly that long. As for placement options, you’re pretty limited because moving the wires around would be tricky. And if the right wiring isn’t already in place, it could take even longer to install the wiring for your Nest doorbell. It’s not a stretch to say the Nest doorbell is the best on the market. Compared to the Ring 2 and Ring Pro, the Nest Hello gives you better video quality, fewer hiccups in its day-to-day performance, and better features (like the HDR video and facial recognition). So if you’re able to opt for a hardwired doorbell camera, we’d recommend the Nest Hello. If you’re a renter or you’re limited in terms of hardwiring a doorbell camera, we recommend looking into a Ring wireless doorbell camera.